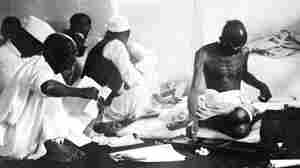 December 14, 2018  Early in his career, iconic Indian reformer Mohandas Gandhi made remarks demeaning black Africans. After the statue was unveiled two years ago, professors started a petition calling for its removal. October 7, 2016  Professors campaigned to have the statue at the University of Ghana removed over Mohandas Gandhi's "racist identity." Now the Ministry of Foreign Affairs says it wants to move it — for its protection. 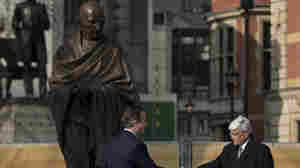 March 14, 2015  NPR's Ari Shapiro says the statue underscores how much the U.K.-India relationship has changed since Mohandas Gandhi fought for independence from Britain nearly 70 years ago. 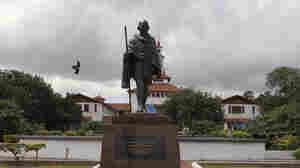 October 11, 2014  In a week when two Nobel Peace Prize winners were announced, NPR's Scott Simon reflects on Mahatma Gandhi's life. Though Gandhi never won the prize, 2014's winners carry on his legacy. November 5, 2013  The Indian independence leader used the portable "charkha" to make his own thread and cloth while a prisoner of the British in the early 1930s.